Home > Blog > A mine of information for your French campervan trip. Whether you are looking for information about a specific town before your campervan trip or spontaneously in need of things to do having stumbled across a nice town, the “Office de Tourisme” is an excellent, free resource and there is one in practically every town in France. They provide free information on local attractions, places to stay in your campervan, restaurants and events and will also help with just about any other information you might need from public transport options to providing a list of local vineyards that are open for wine tastings. Their websites are usually great too so well worth a visit for trip planning and inspiration. 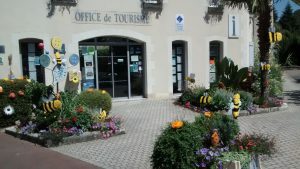 The “Office de Tourisme” can range from a vast building with 20 staff in a big city to a small wooden hut manned by one English speaking volunteer in a tiny village. They are always willing to help tourists and in our experience go out of their way to ensure you get the best out of a visit to their area. They will even make calls to offices in different areas to help you plan the next part of your trip. We are sure that providing these excellent and comprehensive facilities all over France is very costly (and may not carry on forever with so much information available online now) so don’t be afraid to use them to help ensure they feel needed and remain available to us all. They are, after all, there to help you, the Visitor to France! ← Help! Have you got any campervan advice for your fellow countrymen?